Ampersand is pleased to present The River Keeps Talking, an exhibition featuring recent work by gallery artists Ellen McFadden, Clayton Cotterell and Matthew F Fisher. In my memory, summer has always been immersed in water. The flow of the Eagle River outside my childhood home, boating on high Colorado reservoirs, sunning on the shores of Puget Sound and now swimming in the many Oregon rivers just a short drive from the gallery. Perhaps it is a universal memory, a visual infatuation with the way water moves, reflects and sustains, how it creates stories. “One of my memories of the Columbia River was watching the little lights at night,” Ellen McFadden wrote me after a recent visit to her studio, “all around on the river, lights on the commercial gill nets drifting with the tide and the currents.” She was reflecting on her own personal history with a vast Northwest waterway dating back to the 19th century, when her great-grandfather settled in Rainier, Oregon to fish for salmon on the river. “A lovely memory,” she continued, “but one of the many reasons the river is nearly dead today.” It is a dichotomy contained in the titles of many of her paintings, but one never visible on the canvas itself. 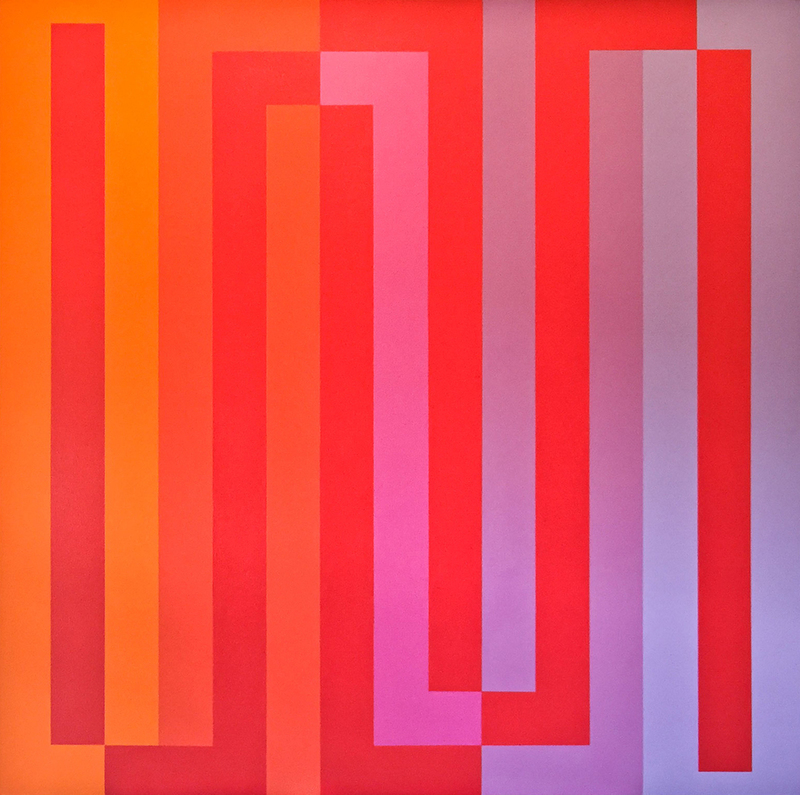 A series of long rectangular shapes, for instance, drift beautifully from purple-blue to red-orange in two recent works, Solkuks Wanapum and Wanapum. As a pair, they are subtly different and yet flow harmoniously one into the other, not unlike the confluence of the Snake and Columbia Rivers, downstream from where the Wanapum Indians once lived and fished before being displaced by dams in the 1950s. Water also often figures in the photographic work of Clayton Cotterell, by coincidence a native of Longview, WA, a lumber town on the Columbia. His recent work captures the subtleties and sensuous nuances of common surfaces. The surge of a river current and a vast oceanscape seem familiar at a glance but grow increasingly abstract when flanked by two silvery-black landscapes that have been deliberately manipulated. Untitled, and therefore without place, it is only because they are photographs that we assume these locations actually exist. Matthew Fisher’s paintings, on the other hand, do seem to come from a place of imagination (or the semblance of something remembered). Stylized cloud forms, waves and suns merge with reflective water surfaces. We view the scenery of his world from sandy and rocky shorelines. Sometimes it seems we are floating within the water itself. 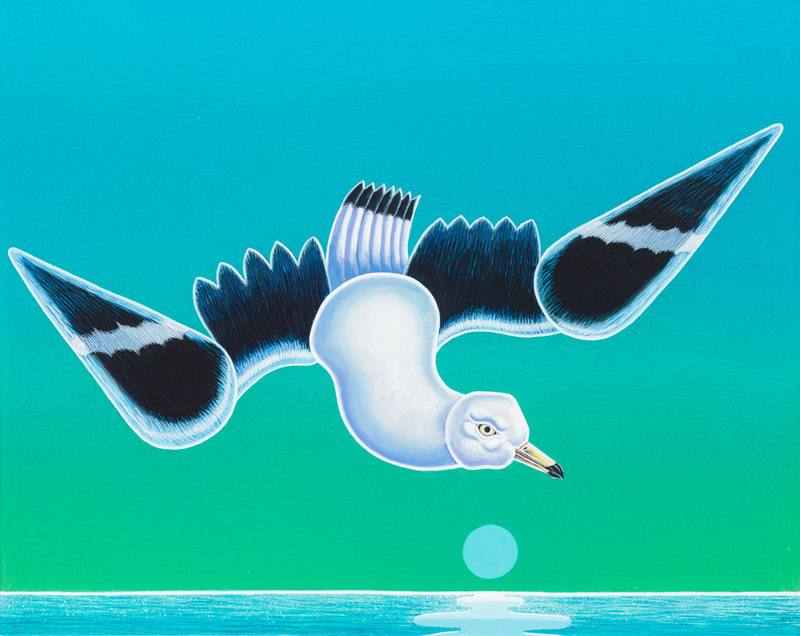 Or, in the case of a new painting titled Days, we are flying alongside an ocean bird, drifting while the sun sets on another memory of summer. Ellen McFadden was born in Portland, OR in 1928. After a long career in graphic design and arts education, she now works full-time on paintings that incorporate pattern and vibrant color, their titles alluding to the Northwest geography and native tribes that are so engrained in her personal history. In addition to a solo show (here) at Ampersand in fall 2014, her paintings were recently exhibited in a show at Wieden+Kennedy curated by Ademar Matinian. Matthew F Fisher lives and works in Brooklyn, New York. His paintings and drawings have been widely exhibited, including a solo show (here) at Ampersand in March, 2014 and a recent solo presentation of drawings at Sardine in Brooklyn, NY. Clayton Cotterell lives and works in Portland, OR. Photographs from his series Arrangements were exhibited at Ampersand in summer, 2013 and subsequnetly published as photobook by the same titles, available here. © 2015 Matthew F Fisher, Ellen McFadden, Clayton Cotterell and Ampersand. All Rights Reserved.